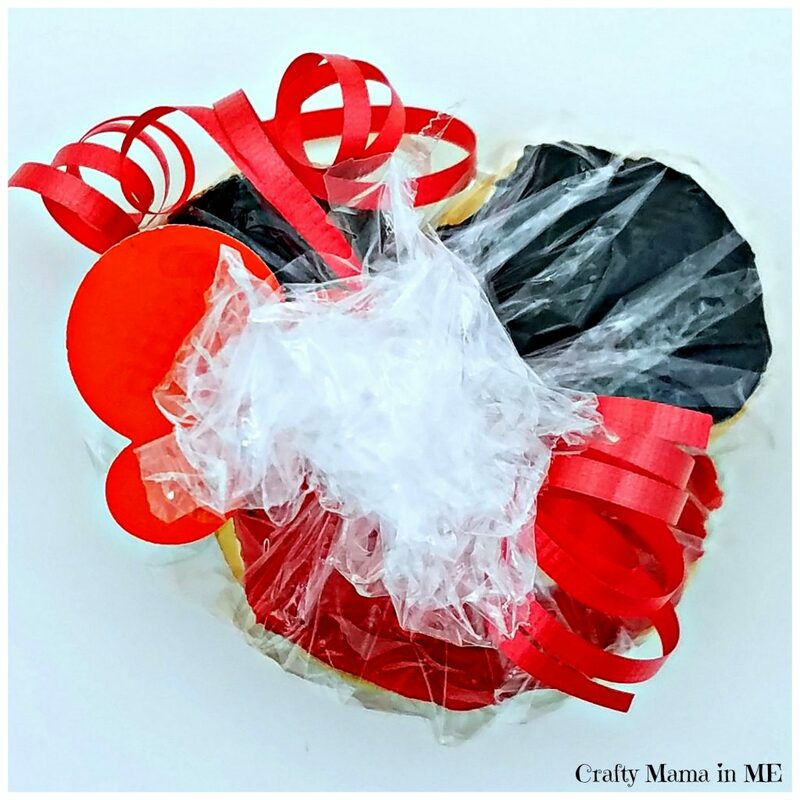 Surprise Mickey Mouse Themed Hidden Treasure Cookies - Crafty Mama in ME! 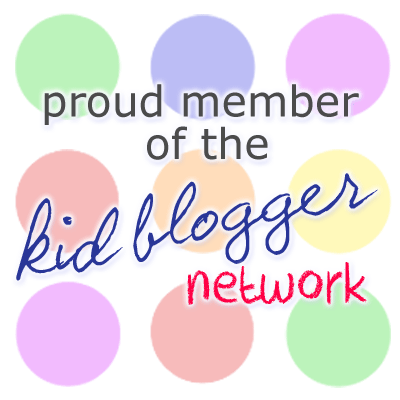 Today I’m going to share something that combines two of my passions – baking and Disney! We are gearing up to head out on a trip to Disney World and I decided it was time to share these cookies with you! 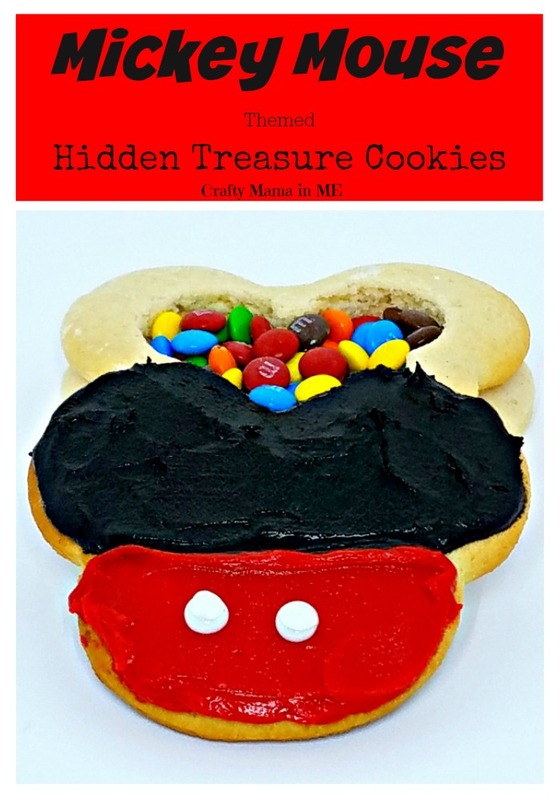 I’ve made these Surprise Mickey Mouse Themed Hidden Treasure Cookies a few times and they are a hit each time. 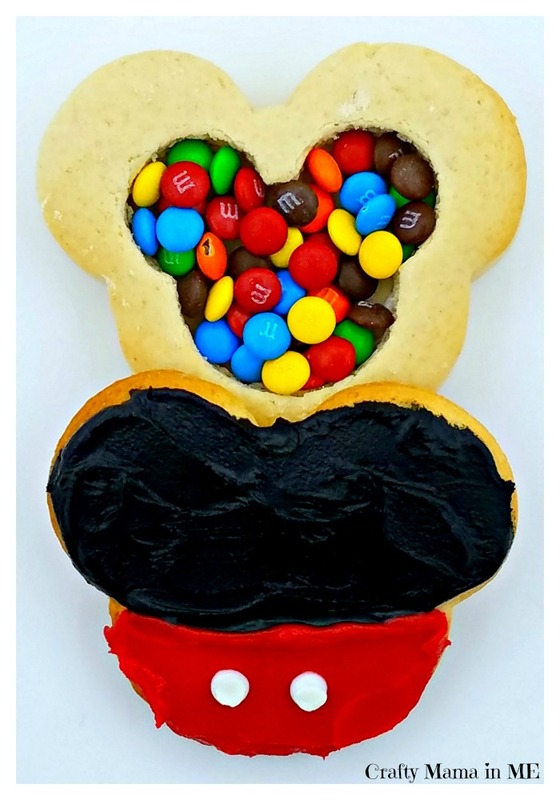 These cookies would be the perfect way to reveal that you are heading out on a Disney vacation! The cookies start out with my basic Sugar Cookie recipe that you can find below. The recipe was handed down to me from my mom and I’m not sure where she got it from herself. It makes a nice, fluffy, easily roll-able cookie dough. Cream the sugar and shortening. Add the eggs, milk, vanilla, baking powder and salt and mix on high speed until fully combined. Slowly add the flour - add above 4 cups if the dough is still sticky. Refrigerate the dough until chilled. Roll on a lightly floured surface. Bake at 375 until lightly browned - roughly 10-12 minutes. 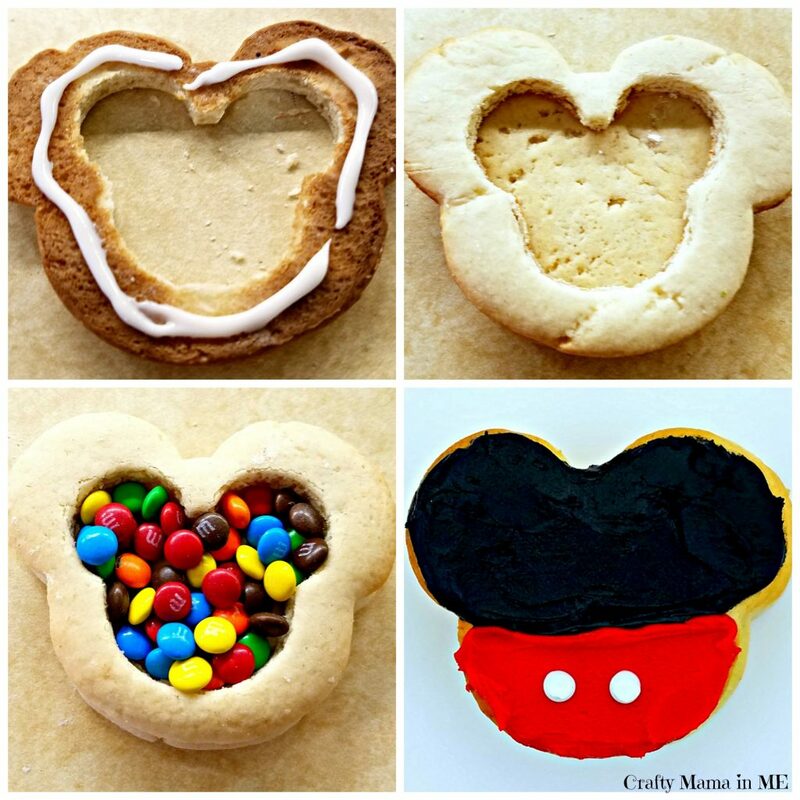 Once you have made your dough and chilled and rolled it you are ready to get started making your Mickey Mouse Themed Hidden Treasure Cookies. Roll and cut three large Mickey Mouses per cookie that you want to make. The dough recipe should have been enough to make 6 or 7 completed cookies. Bake the cookies 10-12 minutes or until lightly browned. 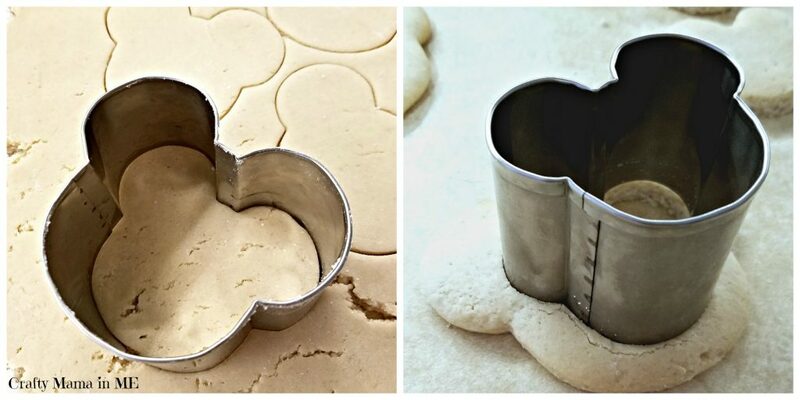 Before you transfer the cookies to a cooling sheet use the small Mickey Mouse cookie cutter to remove the center of one third of the cookies – this will be the center layer of your completed cookie. Let the cookies cool completely. Place one large complete Mickey Mouse on your counter. Next take a Mickey Mouse that is missing its center and pipe a thin layer of frosting (I used the white) around the outside edge of the bottom of the cookie. Place the Mickey Mouse that is missing its center on top of the whole cookie (check to make sure you have enough frosting for the cookies to stick together). Fill the center of the cookie with mini M&M’s. To finish the hidden treasure cookie you need to decorate the last cookie – the final cookie acts as the lid. Frost the top of the cookie (the ears) with black frosting. Frost the bottom of the cookie with red frosting. Finally pipe to white dots (or use a small white candy) for Mickey’s buttons. If the cookies are for gifts ensure you allow the frosting time to harden prior to bagging the cookies to ensure the frosting does not smear. 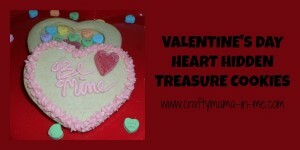 We have also made these fun hidden treasure cookies for Valentine’s Day as well.